I picked up Pink's latest book yesterday. Essentially, the book takes up theories of intrinsic motivation and positive psychology and applies them to business management theory. Pink also has a TED talk that outlines the basic experimental evidence that underlies the argument he makes in the book (evidence that the book further expands upon, though always in a layperson's discourse). I've discussed this talk here before and the subject of motivation, pedagogy, and writing many times. But here I want to think through these issues more in terms of writing program administration. 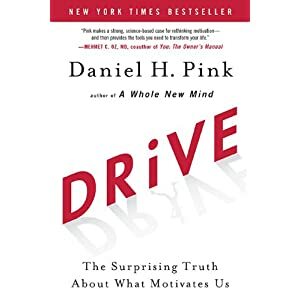 Pink suggests that the dominant theory of motivation (that in academia we might think of as desire) has flaws that have become significant given the new types of labor we ask employees (and I would say students) to do. As he puts it, in simplistic terms, there's Motivation 1.0, which are our animalistic drives for food, safety, and procreation. Motivation 2.0 extends upon those more immediate drives with extrinsic motivators, which are basically carrots and sticks. As he explains, carrot/stick motivators work fine for simple, algorithmic tasks, where we ask students/employees to perform rote procedures. The important thing the research shows, however, is that when one asks people to perform heuristic tasks, tasks that require inventive and creative thinking, that the carrot/stick act can actually serve as a disincentive to performance. Obviously the composition course is a place that calls for heuristic acts, though this is something that we have struggled over in various ways. Over the last century as a culture we have tried to turn education into an algorithmic procedure that can be incentivized with carrots and sticks from grades and detention to high-stakes testing for district funding. We have tried to turn composition into an algorithmic procedure as well, even if that wasn't what people originally intended in talking about the "writing process." Furthermore, the course is incorporated into a larger motivation 2.0 structure of grades and credits. But let me fold this back to a familiar composition scene, where the student asks "How can I revise this to get an 'A'?" And the koan-like answer is that your best chance of getting an A is to stop writing for the purpose of getting a good grade. The carrot of the A is actually limiting your performance. Of course it isn't that easy. Ironically, the whole system is designed to dissuade learning and creativity, and over time these motivational structures do lasting damage to students, as Ken Robinson has famously articulated. It isn't intentional, of course; it's just that the system is designed on a poor theory of mind. According to the research that Pink cites, in order for people to be most successful at these complex heuristic tasks, they need to be intrinsically motivated, and he describes three key foundations to that motivation: autonomy, mastery, and purpose. In some ways, academia ought to be an ideal model for the kind of workforce and workplace Pink is describing. We have a very high degree of autonomy in the way we work. We generally work hard in the pursuit of mastery over our subject, while always knowing that there is more to know or discover. And we also tend to make strong connections between the narrow focus of our research and grander cultural and intellectual purposes. However, there are obviously general problems with the management of higher education and I think that infamously academics can be horrible managers of other academics (though that isn't true in every instance). In part, the problem is that sometimes academics end up in administrative positions for the wrong reasons, and they don't bring the creativity and passion they have for their research or teaching to their administrative roles. There is a long standing tradition of antagonism, generally, between faculty and administration, which I would hypothesize stems from the tradition of "motivation 2.0" with its carrots and sticks and its focus on controlled, routinized tasks. As Pink points out, these strategies are poisonous to the heuristic challenges of both research and teaching. However, it's not all that simple. In UB's composition program, we have a long tradition of giving instructors a high degree of autonomy in constructing syllabi and assignments. While there have certainly been successes as a result, the practice has not been without problems. There are always limits and contexts for autonomy. As the director of composition, I can only loosen the restrictions that I put in place. For example, I can't alter the length of the semester or change the fact that students need to be graded at the end of the semester. A composition course isn't a course in auto repair or calculus. As Pink puts it, the autonomy here is over task, technique, time, and team. What you are going to do, how you are going to do it, when you are going to do it, and who you are going to do it with. Task is certainly related to purpose (purpose is a big picture task, I suppose). And technique might be one of the objects of mastery. So here's how I see it. We start with the WPA Outcomes Statement. It's sweeping and fairly general, Many of the terms are open to interpretation and debate. And in my view, many of the outcomes themselves could be interrogated and others added. As Pink points out, extrinsically motivated people play within boundaries (in an effort to get carrots); intrinsically motivated people play with boundaries. So even if you view the statement as boundaries, we want to play with them. Similarly, our program has certain constraints and policies (which are themselves open to periodic review and change). We can and should play with those boundaries as long as we keep a larger sense of common purpose that hinges on professional ethics (and if you can't play in that broad space, that's fine, you just need to find a different profession). There are ultimately limits, but I think there's a wide degree of autonomy within that, particularly if you have a personal sense of professional purpose that is at all connected to the discipline. Within those contexts, instructors ought to be able to define their own tasks (e.g. this semester I am going to focus on developing methods for teaching revision or digital composition or whatever); they can develop their own techniques or pedagogies; they can set their own time to work (beyond the constraints of course scheduling); and they might think about team as well (finding colleagues in the program to share ideas with and collaborate; this is not done enough!). in these flow states where our ability to grow is maximized. Of course we are not always in a flow state, but as a WPA, one challenge might be to maximize the opportunities for teaching to put instructors in these opportunities. Pink also points out that mastery is difficult (of course), and that it requires an ability to grind it out sometimes. The flow state can help us get over those difficult moments. Also, we need to recognize that mastery is developed not inherited and that it is ultimately unreachable: we can always improve. It is the journey that is intrinsically rewarding and motivating: not the extrinsic carrots one might encounter along the way. Finally there's purpose. I don't think rhet/comp or academics in general have much trouble connecting their work to grand purposes like saving democracy or illuminating the Truth. In fact, I tend more to be skeptical of such claims. At the same time, I recognize the importance of having a larger sense of purpose (though maybe not quite that large). As Pink points out, one of the strategies here is to give employees the opportunity to connect their work to a personal sense of purpose. In a composition program, I think this works through giving instructors the opportunity to develop the content and assignments for their courses. If an instructor has a passion of the environment, then s/he can focus on that or maybe the passion is education or media or cultural difference. At the same time, it is important for instructors to recognize their own managerial role. Just as the program needs to create opportunities for instructor autonomy, mastery, and purpose, each course needs to do this for its students for the students are also engaged in heuristic work that requires intrinsic motivation. And furthermore, one might imagine that as writers we bear a somewhat similar relationship to our audiences where, rhetorically, we want to engage our readers, bring them into a state of flow, and interact with their own motivations. Certainly, to some degree, Pink's book did that for me. Hopefully it is a virtuous rather than vicious circle.